This interactive, multidisciplinary sculpture is a physical installation allowing users to physically explore colors of light. Alfred University Senior Shows — Spring 2014. This work harnesses six Kinects to form an interactive system where users can physically move around a color wheel, mimicking the selection of a color on a computer screen. Multiple users can interact simultaneously, exploring RGB additive color theory. Each Kinect captures a 60° radius, meaning my six Kinect system completes a full 360° outward monitoring system. Each camera captures motion and depth independently, yielding thousands of possible color combinations. The six-sided hot cast glass prism is a means of presenting colors at the center point of focus. I engineered the pedestal to separate the different elements while also housing the hardware essential to its temporal existence. The floor projection allows users to understand the system before entering its interactive space. Ideally I would have installed this in a room with a taller ceiling so that the projection reached to the threshold of interaction. Being able to pass into the projection to instantaneously have the prism illuminate was my vision. I designed this work to be as simple as possible. I wanted all focus to stay on the interaction between the user and the prism. This concept could be implemented into a science museum exhibit where users could learn the difference between additive and subtractive color spaces. Inside my Interactive Color Wheel were 6 Mac Mini computers, each running their own custom software programs. I presented these six visual programs by laser etching each one onto its own woodblock. I then printed these woodblocks, each using their corresponding colors. 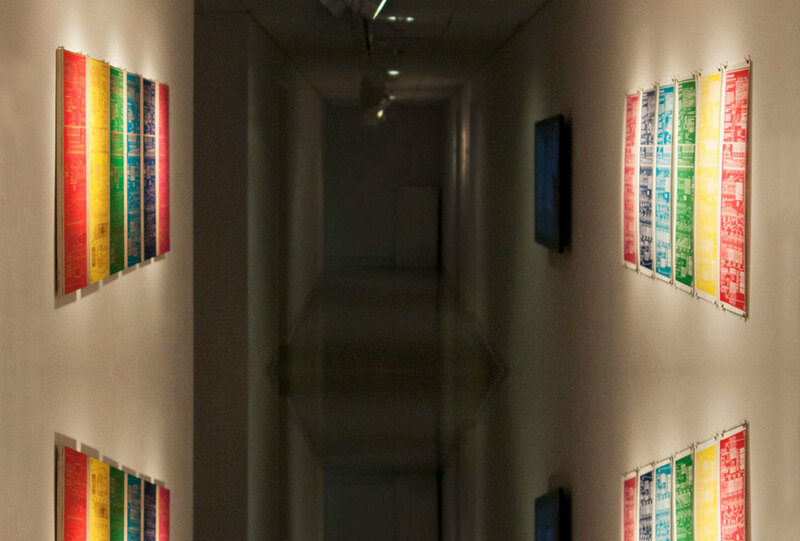 I chose to display the prints by mirroring them from their blocks in the hallway outside of the Interactive Color Wheel. These inked woodblocks mirroring block prints is a work called Materialization. 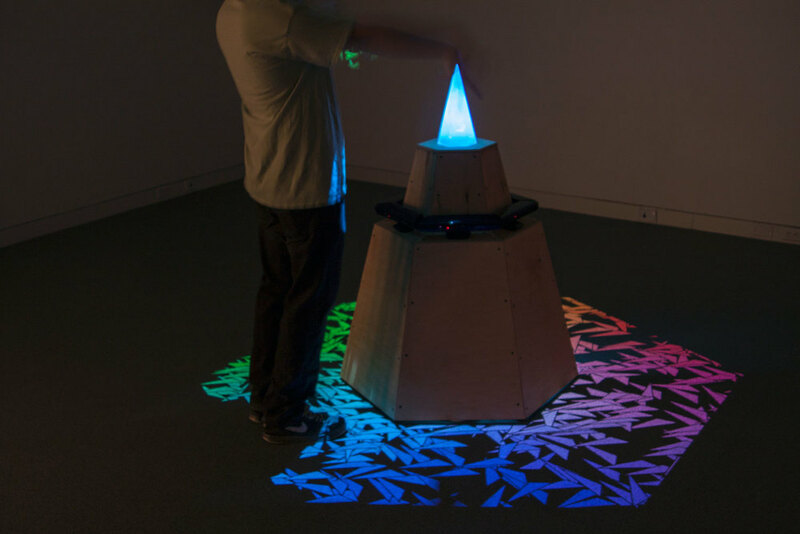 While the Interactive Color Wheel video sculpture is an interactive space with causation, the mirroring blocks and prints suggest a cognitive space where you can interact within an intangible environment between the block and its print. This title is quite amusing because while the programs transcend into material form they are also simultaneously dematerializing, similar to a script from a play.